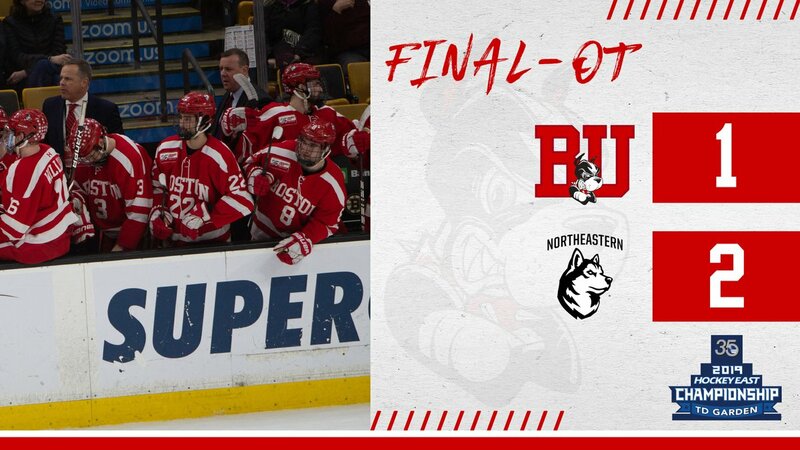 BU’s attempt to defend its Hockey East championship came to an end with a 2-1 overtime loss to Northeastern, echoing a defeat by the same score in overtime in the Beanpot. With the defeat, BU finishes with a 16-18-4 record. The Huskies will face BC in tonight’s title game after the Eagles upset regular-season champion Massachusetts. The Terrier took a 1-0 first-period lead on Ty Amonte’s power play goal, converting the rebound of David Farrance's shot. Patrick Harper nearly doubled the lead when his shot off a Logan Cockerill feed hit the post, the first of two BU shots that caught iron. After a scoreless second period. BU gave up the lead 16 seconds into the third. Tyler Madden collected a puck that deflect off a BU stick and beat Jake Oettinger. Midway through the period, Shane Bowers' scoring bid went off NU goalie Cayden Primeau and then off the post. At 15:44 of overtime, Northeastern took advantage of a weak clearing attempt around the board and set up Zach Solow in the high slot for a shot that beat Oettinger high to the glove side for the game-winner. ►GoTerriers.com staff writer Scott Weighart recapped the contest and spoke with Coach Albie O’Connell, senior co-captain Bobo Carpenter, senior Ryan Cloonan and junior co-captain Dante Fabbro. Both teams had goals disallowed for goalie interference. Oettinger stopped 42 of 44 Husky shots. In his two games against Northeastern in the Garden he turned aside 89 of 93 shots for a .957 save percentage. BU played with out its leading scorer, Joel Farabee, who suffered a knee injury in the third game of the quarterfinal series against Lowell. 2019 recruit Trevor Zegras scored his 23rd goal, added an assist and earned second-star honors in the NTDP U18s’ 7-3 win against Des Moines. His tally was the 600th scored by the current U18 class in their two NTDP seasons. Jordan Greenway scored his 12th goal in Minnesota’s 2-1 win against Washington.